We’ve officially made it to the second consecutive event in an insane week of fights in the UFC and boy are we in store for another treat! Top to bottom, this card has a bunch of gems on it, but the headliner is a must watch. 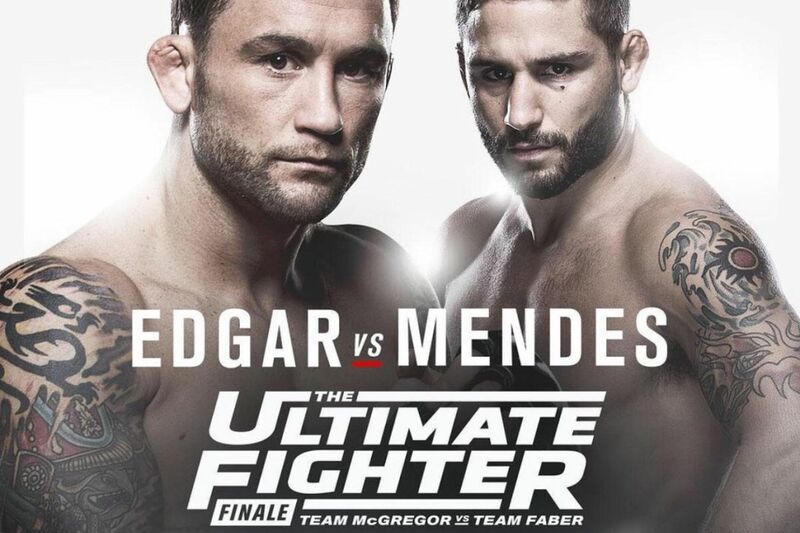 Frankie Edgar and Chad Mendes are the elite of the elite fighters in the UFC and boy I can’t wait till they throw down, as this fight is going to perhaps elevate whomever to be the next contender for the Featherweight title. For Frankie Edgar, pending he wins and also pending Jose Aldo can defeat Conor McGregor, then there is no doubt in my mind he gets the next title shot. If Conor McGregor wins however, Edgar will get passed over due to the immediate rematch of Jose Aldo and Conor McGregor. To throw another hypothetical in there, if Max Holloway defeats Jeremy Stephens, then Edgar vs. Holloway will undoubtedly fight to be the next contender, again only if Conor McGregor beats Jose Aldo. For Chad Mendes, I think a win over Frankie Edgar is huge for his legacy and status in the featherweight division, but I think the waters are murky on getting a title shot. I could see him being passed over by A. Aldo vs. McGregor rematch, B. The fact he lost to Aldo twice already, C. The fact he lost to Conor McGregor most recently and D. Being passed over by Max Holloway. I apologize for this hypothetical madness I present, but I can’t wait for the fight to go down and to see what that does for the victor. Let’s breakdown this Main Event first with one the pound for pound greats Frankie Edgar locking horns with the powerful Chad Mendes. Edgar will bring his insane pace, solid MMA wrestling and volume punching to the table, as Mendes will try to counter with his top notch wrestling abilities and heavy hands. I think this fight will really come down to who brings the non stop pace for five rounds and that’s Frankie Edgar. Mendes himself, has shown to have excellent cardio when he has a full training camp (which he does), so I’m not discounting that. I just firmly believe that no one in the UFC has the pace and volume striking Frankie Edgar has. He has the ability to literally break you down to the point where you basically succumb ala Cub Swanson. Mendes does feature something that perhaps Edgar hasn’t faced, is a fighter with real power in hands. Now, I know that Gray Maynard had Frankie Edgar rocked multiple times, but Maynard has only knocked out two fighters in his career. Mendes has knocked out six of the last seven fighters he defeated. So, I think it’s obvious when I say, he’s got legit power. However, Edgar is one of the most elusive fighters in the Featherweight division and I actually think since the last two Maynard fights in which he got rocked in, he hasn’t really been hit or rocked in any since. So, what I think is going to happen, is that Edgar is going to use that guerrilla warfare-like tactics on the feet. He’s going to mix in some takedowns and systematically look to wear down Chad Mendes as each round goes on. We should see a lot of rinsing and repeating and I believe that Frankie Edgar will either finish this fight late or take a decisive decision. 155 lbs. : Tony Ferguson vs. Edson Barboza – Two Dynamic strikers, but Ferguson is the better overall fighter and has a chin, as opposed to Barboza. 155 lbs. : Evan Dunham vs. Joe Lauzon – Great matchmaking, but I think Lauzon is too crafty of fighter and will submit Dunham at some point. 145 lbs. : Tatsuya Kawajiri vs. Jason Knight – Kawajiri impressed me against Siver and has one of the best top heavy ground games, it’s honestly suffocating. 265 lbs. : Gabriel Gonzaga vs. Konstantin Erokhin – Erokhin got manhandled in his last fight and Gonzaga specializes in that, well the non-K1 Gonzaga. 170 lbs. : Ryan LaFlare vs. Mike Pierce – I think we may have a split decision in this one, but I’m siding with Laflare due to his volume striking. 125 lbs. : Joby Sanchez vs. Geane Herrera – Herrera is a stud and is going to open some eyes here, in a super under the radar fight. 155 lbs. : Chris Gruetzemacher vs. Abner Lloveras – Again, I’ve never seen them fight, but the coin flip goes to Gruetzemacher.